David Mitchell and Robert Webb once again return to mainstream comedy after their highly popular stint in the series called Peep Show which I would highly recommend to all connoisseurs of British comedy investigate. That Mitchell and Webb Look feature these two comedians and good friends in a variety of different stand-up sketches and if you enjoyed Little Britain, you will definitely find this up your alley in terms of humour. From two drunken snooker commentators that verge on homosexually to my favourite skit, Britain’s worst crime fighters that revolve around two bumbling men called Angel Summoner and the BMX Bandit, these two idiots must be seen to believed. Classic! As with Little Britain, some of the skits fall a little flat but the majority of skits are quite entertaining and memorable. 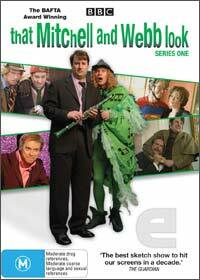 With decent video and audio quality, the special features of the disc includes some hilarious outtakes, deleted scenes and even a “making of” documentary that nicely rounds up this hilarious British series.